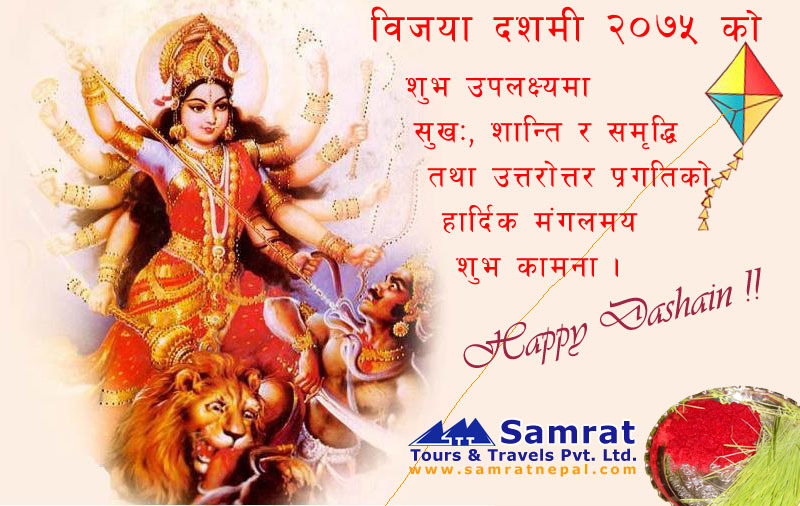 “Navaratri Parba” or the nine-night festival of Bada Dashain, the great festival of the Hindus of Nepal, commenced from Wednesday. The first day of Bada Dashain festival is called “Ghatasthapana” that falls on Aswin Shukla Pratipada, the first day of the bright half of the lunar calendar in the month of Asoj. On the day of Ghatasthapana, all Nepalis worship Diyo (an oil-fed lamp), Kalas (auspicious jar) and lord Ganesh in accordance with Vedic rituals and sow maize and barley seeds in a jar filled with soil and cow dung for germination of the auspicious Jamara (barley shoots). The auspicious hour for observing Ghatasthapana is 07:15 am today, according to Nepal Calendar Determination Committee. Prayers are also offered to Durga Bhavani, the goddess of power today. Germination of the auspicious “Jamara” is also initiated at Hanumandhoka Dashain Ghar in accordance with Vedic rituals, today. There is also a tradition of sacrificing animals while initiating the germination of the “Jamara”. Also today, prayers are offered to goddess Mahakali, Mahalaxmi and Mahasaraswati at the Dashain Ghar, marking the beginning of the Navaratri (nine nights). 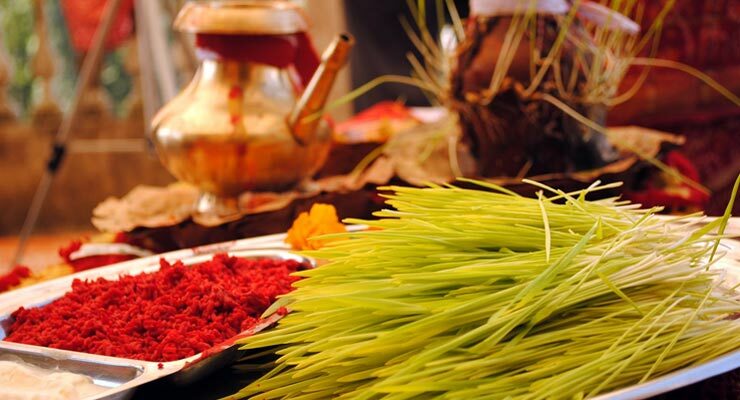 The golden barley shoots and the auspicious Tika are given by parents to their children and by elders to their juniors on the tenth day of the Bada Dashain festival with blessings for peace, progress and prosperity. The auspicious hour for receiving Tika this year is 09:51 am on October 19, according to the Committee Chair Dr Ram Chandra Gautam. 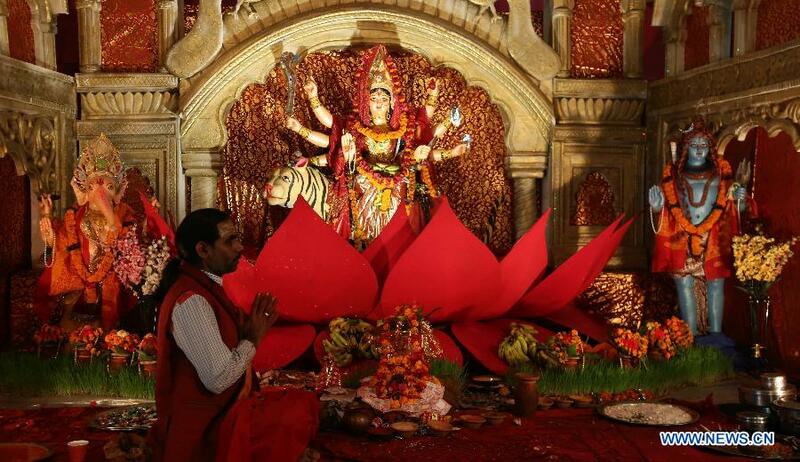 During the Navaratri, thousands of devotees visit Naxal Bhagawati, Shobha Bhagawati, Maitidevi, Guheswori, Bhadrakali, Kalikasthan, Sankata, Mahankalsthan, Naradevi, Bijayeswori, Indrayani, Dakshinkali, Chamunda and other shrines of goddess Durga Bhavani in the early morning. People also recite sacred verses and hymns dedicated to Durga Bhawani at temples and shrines as well as at their homes throughout the Dashain period. 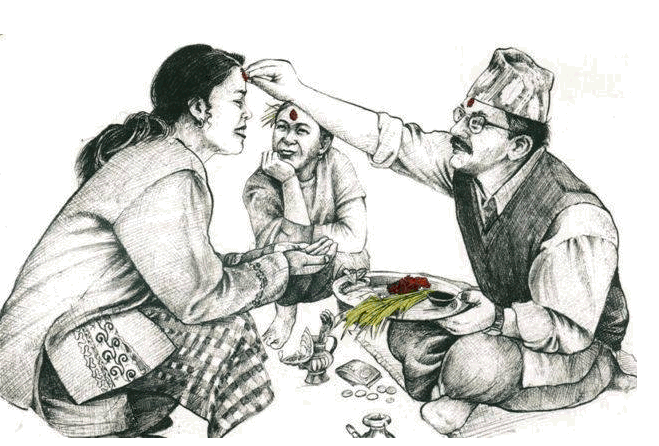 Majority of the educational and academic institutions start Dashain holidays effective today. The public holiday unlike the past to mark the Ghatasthapana has been deducted from this year. The Dashain Festival is also celebrated by Hindus and Nepalese in practically every other part of the planet where they live. 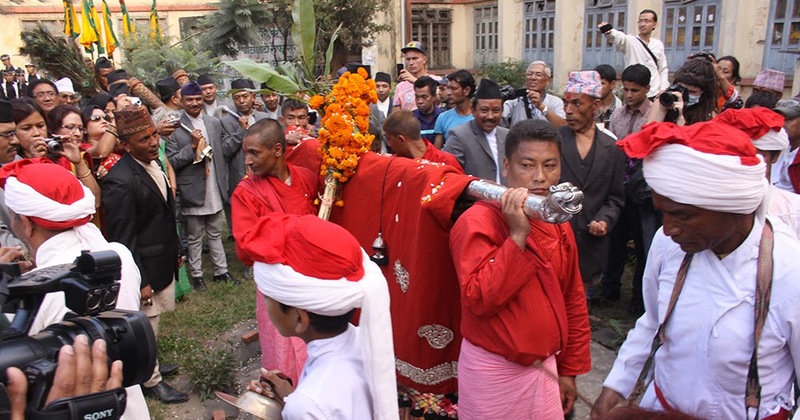 In Nepal, Dashain is the longest and most notable festival on the calendar, and many Nepalese expatriates actually return to Nepal specifically to observe Dashain Festival in their homeland. Dashain runs from the “bright moon” until the full moon in the Hindu month of Ashvin, lasting for 15 days. On the gregorian calendar, it falls in either September or October, varying from year to year due to the differences between a lunar versus a solar based time-keeping system. During Dashain, many Nepalese businesses and public buildings will be closed, so the tourist will need to plan ahead carefully. People Kite fly highly decorative kites from their roof tops and elsewhere and shout out “Changa Cheit” whenever kite strings get tangled. Dashain is celebrated to mark the victory, according to Hindu religious writings, of Ramayan over the evil demon-king, Ravana, and over the demon Mahisasur, who cruelly terrorised the people of India in the form of a raging water buffalo. The Hindu goddess Durga was said to be instrumental in winning these victories, so she is especially worshiped at this time. In general, the holiday season of Dashain is a celebration of “the triumph of good over evil,” though it is tied to specific Hindu stories. 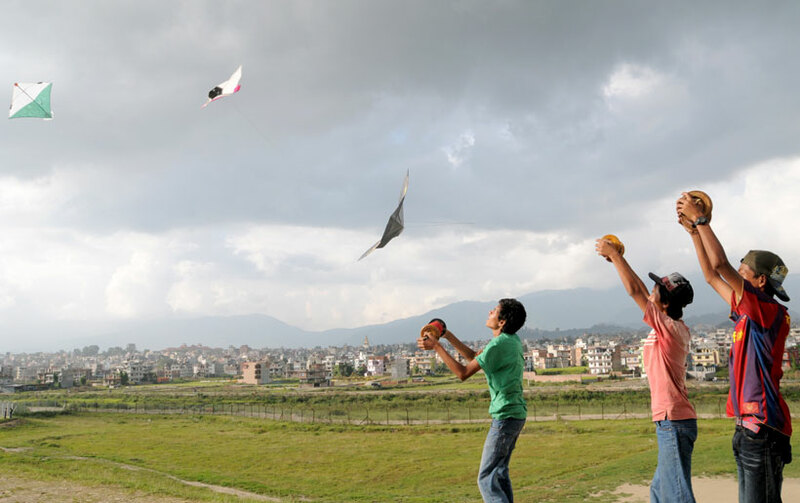 Kites a flown as Dashain Festival draws near and during the festival. People fly highly decorative kites from their roof tops and elsewhere and shout out “Changa Cheit” whenever kite strings get tangled. Playing card games is common during Dashain. Families get together to play for both money and for fun. While all ages take part in kite-flying, kids usually are out flying their kites while adults play the card games. Homes are cleaned thoroughly and decorated ornately. This is meant to be a gesture to the Hindu “mother goddess” to come down and bless the home with good luck. Distant family members also gather and enjoy reunions in the clean and beautiful houses. Many purchase new clothing and wear it at this time of year. Those who live in dire poverty don their best clothing and may buy clothes at few other times of the year besides Dashain. Temporary swings are constructed out of bamboo and set up for children to play at. Adults even stop to try out the swings, which can be up to 20 feet high. They are disassembled at the end of the festivities. Literally thousands of animal sacrifices are made, including buffalo, rams, and ducks. They are meant to appease Hindu goddesses and are sacrificed at temples all over the country. Many also rise early in the mornings and visit temples to worship various gods. Since Dashain Festival arrives just after the harvest, there is much rice and grain in homes at this time of year. Worshipers use pigmented, red rice, called “tika,” to mark their foreheads. Some also mark them with a white circle instead, however. Attend numerous small fairs held in Nepalese villages, which often have Ferris wheels and other rides and entertainment. In major cities, like Kathmandu, you can expect to find larger fairs with more options. Listen to Nepalese musical programs held at this time of year. There is “Dashain music” as surely as there is Christmas music, and it is called “Mal Shree Dhun.” In the Terai and Madhesh regions, you will especially find many musical opportunities. 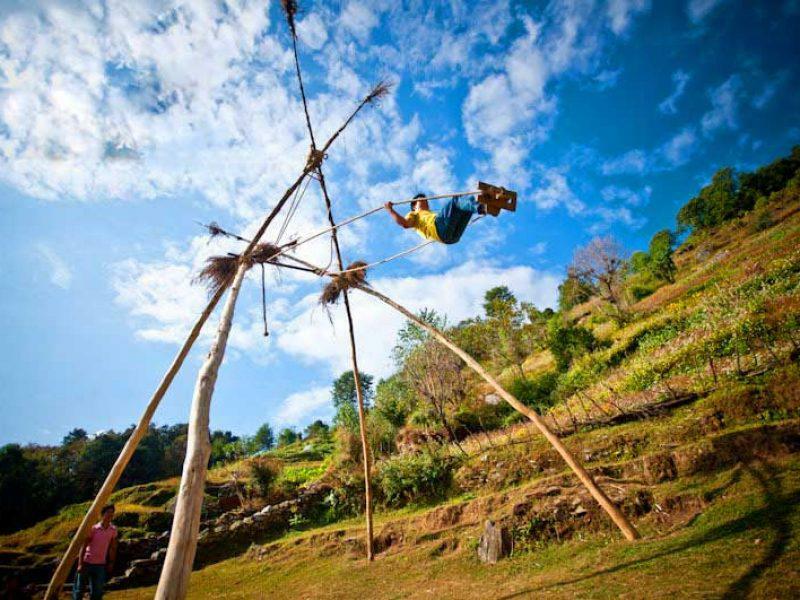 Observe Dashain processions through the “three royal cities” of the Kathmandu Valley. The spectacle is very colorful and busily attended. 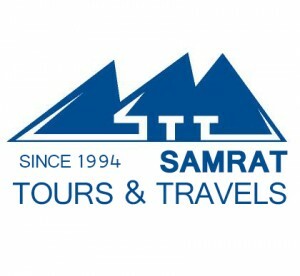 It has a religious bases, for it involves the carrying of numerous statues of Hindu gods.